The Qiviut Smoke Ring is a seamless cylinder of lacy knitted qiviut yarn. 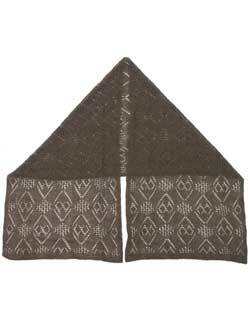 It may be worn just around the neck or around the neck and drawn up over the head as a hood. The name Smoke Ring was chosen for this innovative accessory since the qiviut is so soft and comfortable it is hardly noticeable except for its warmth. The Smoke Ring is elegant, but so practical it will become your first choice for everyday use in cold weather. It is about 18 inches tall and 24 inches in circumference, hand knitted in the Harpoon pattern from Mekoryuk on Nunivak Island. The pattern is derived from a 1,200 year-old ivory harpoon head found on the island. The color is the natural brown. Hand wash, dry flat. Made in USA. Please note: Each smoke ring is handknitted by a member of the Oomingmak Musk Ox Producers' Co-operative. Although the same pattern and number of stitches is used, the final measurements of the smoke ring will vary with the tension of the individual knitter. 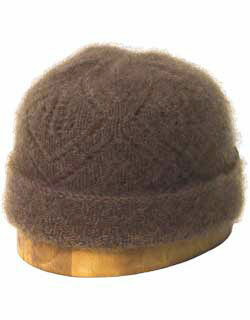 Qiviut (pronounced "kiv-ee-ute") is the under-fur of the musk ox, the warmest softest wool known. 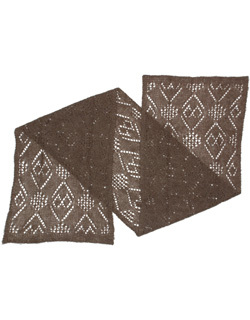 The qiviut we offer here is handknitted into scarves and caps by the Eskimo women of the Oomingmak Musk Ox Producers' Co-operative. Supply of these marvelous goods became a possibility only when John Teal in 1964 started the Musk Ox Project to bring together re-establishment of the musk ox in Alaska and relief from abject poverty for the Eskimo in the outlying coastal villages. A domestic herd of musk oxen was established, from which the qiviut could be combed each spring for spinning into yarn. Today knitting qiviut is a culture-friendly source of cash income for the coastal villagers, supplying a unique product from a growing arctic resource. We at David Morgan are pleased to be selected as the first of the mail order companies in the lower forty eight to be able to offer this outstanding product. 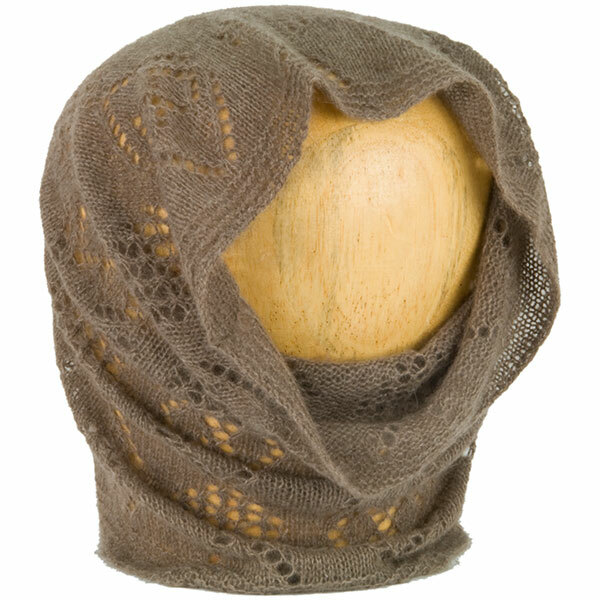 Unlike most wools, qiviut is not scratchy and will not shrink in any temperature of water. Hand wash in any mild detergent and dry flat for years of use and enjoyment. The Qiviut Smoke Ring, or Nachaq, is a versatile accessory that can be worn around the neck, similar to a neck gaitor, or drawn up over the head like a hood. View the Oomingmak Musk Ox Producers' Co-op YouTube video: How to Put on A Smoke Ring for a demonstration.